SHORT GOLD: Another NINE videos that work effectively – The Dan Slee Blog » LOCAL SOCIAL: Is it time for a Local localgovcamp? When I first started to offer video skills training with the excellent Steven Davies for years ago good examples were hard to come by. The data said it was getting more important but the examples were sometimes hard to track down. Rarely a day goes by without me saving something to take a closer look at. Here are NINE more than impressed me. Human stories shine through as a trend in this collection from men talking about suicide to a young cancer victim and sisters who serve in blue light services. A New Zealand police officer talks through her day in a candid style. Shot like a vlog the nine minute long video is longer than the usual YouTube clip but made an impact in the country. In part, the clip made an impact because the officer was not just female but also quite attractive. The video as a whole mimics a vlogging style that is popular with young people. Lobke Marsden is a nurse who helps children navigate cancer treatments. She’ll paint the mask they’ll have to wear so they’ll feel better about it. Getting through radiotherapy or chemotherapy is an achievement. Ringing a bell celebrates that achievement. Here she is helping a child mark that moment. It’s hard to explain to people how the budget for 1,200 services is spent by local government. So, why not present it as a Saturday night quiz programme? This fantastic video from Swindon Borough Council has real people taking part in a short shiny floor quiz programme. You can see their Facebook post here. People connect better to people like themselves so it makes sense as part of a recruiting drive to feature women. The twist in this short clip is that twins have both joined the emergency services. We see them chatting about the job and finishing each others’ sentences with cutaways of old pictures of themselves. You can see the Met Police Facebook video here. Samaritans answer the phone to people who are at their lowest ebb. Darran was one of those people who was helped by the charity. A short sub-20-second clip on Instagram signposted people to a website with a longer story and a 1 minute 55 second YouTube clip here. I love the fact that its a real story with a shorter clip on instagram compared to YouTube as these lengths work better. 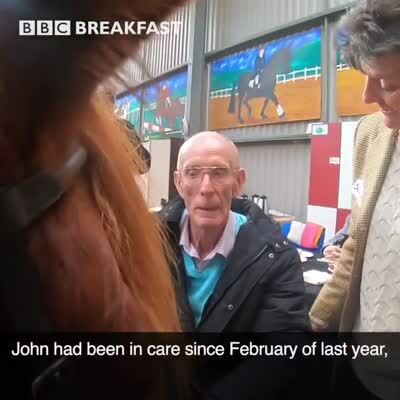 The first three seconds of a social video are vital and the first three here are taken with someone telling a horse: ‘I love you very much’ make an impact. This is a BBC Breakfast package that can be seen on the BBC Four Facebook page here. We can absolutely learn from news social media through their use of something to grab attention in the first three seconds and then run sub-titles to tell the story with interview and cutaways. Caring and hope giving are two of the qualities that make a good social worker. Sefton Council enlist school children from their patch to run through the qualities such a worker needs. It’s bright, eye-catching and never stays still. It has a fine bed of music, sub-titles, local voices and real people whose friends and family are likely to share it online. Happy World Social Work Day to all you amazing Social Workers! Webcams are really old school. You point a camera at a subject and then you stream it. Landscapes work really well as a webcam and this stream that shows the railway track, beach and coastline of Dawlish on the Devon coast. What this does is deliver seductive images from the town to your desktop or device. West Sussex Council enlisted children and a drone to make their recycling video. Children talk in the soundtrack about the importance of recycling. The visuals are of children in a school yard laying out items and making a hashtag by lying on the floor. You can come along to learn more of the essential video skills you’ll need in 2019 here.